New Retail is the trend in China right now. Before November 11st Singles’ day, a day when Chinese spends the most in a year, Chinese e-commerce titan Alibaba flexed its muscles on both online and offline channels. We will tell you four destinations in Shanghai that you can visit to get a glimpse of China’s fast changing retail stores. 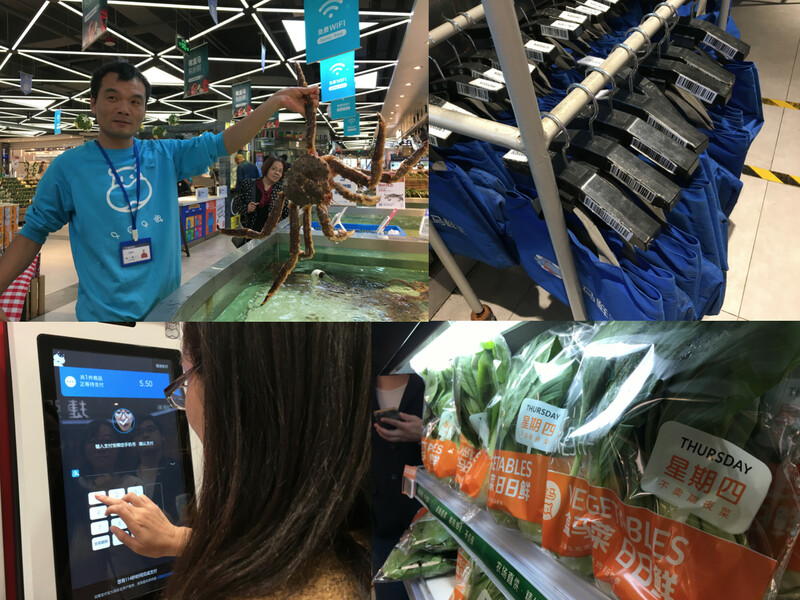 Alibaba’s pilot project for new retail, Hema integrates the online and offline shopping experience by combining three places: supermarket, warehouse, and dining place into one place. Hema store, that much looks like a mart and a food court, is the warehouse and fulfillment hub. Online: Once a user places an order on the app, the staff picks up the goods in a bag that has a barcode. Within 3km radius, users can receive the goods as little as 30 minutes. It says the whole process takes only 9 minutes: 3 minutes for Hema’s staff to pick up goods based on user’s order, 3 minutes for the shopping bag to move from the store to the delivery warehouse, and 3 minutes for packaging the products. Offline – Online: Customers can browse the fresh products in the offline store, then scan the barcode of products to place an order, make cashless transactions, and receive home delivery. Offline: Customers can pick up the goods directly and purchase the products, either by using Hema app that asks you to link to Alipay, or directly pay by Alipay’s facial recognition technology. Alipay only allows those with Chinese ID cards to use facial recognition option. All the products have a unique barcode that the users can scan and retrieve specific information as well as make purchases with Alipay. Hema has lower price line than other stores because they have no middleman, just Alibaba. Alibaba finds the supplier and delivers goods directly to Hema, which keeps the prices low. According to Alibaba, Hema is a startup incubated inside Alibaba for two years, and opened its first store in January 1st in Shanghai’s Jinqiao (金桥国际广场店). Its first store has an online to offline order ratio of 7 to 3, while some other shops have ratio almost close to 5 to 5. Hema customers tend to make return visits, with a monthly average of 4.5 purchases. To purchase goods, users must first download the Hema app. Then Hema amasses users’ data to find out which vegetable is most sold, the duration of a user buying a specific product and which brand users like and derives insight for the supply chain. The data is then sent to suppliers, such as farmers, to let them manage their crop to match the demand and supply, and estimate how much they should supply. Customers can enjoy the food in the store. For example, they can buy a fresh lobster at RMB 99, and ask an onsite chef to cook it in a french style cheese dish by choosing cooking option on the app. Then the chef will give you a buzz alarm, which will give alarm once the dish is prepared. The cooking process of a lobster takes about 75 minutes. There are currently 20 Hema stores in China: 13 of them are in Shanghai, three in Beijing, and one each in Ningbo, Hangzhou, Guiyang, and Shenzhen. Chinese electronics retailer Suning opened its second unmanned store equipped with full face recognition payment system in Shanghai on November 6th. Located at Wujiaochang (五角场) in Shanghai, adjacent to Fudan University, the unmanned store displays four main categories of products, including sports IP products accounting for about 70% of all products on sale. Before entering the store, users download 苏宁金融 (Suning Finance) app on their mobile phone in advance, go through face recognition, and link their bank card. After scanning their face, users can enter the unmanned store to start shopping. Address: 4th floor, Northwest Tower, Jing’an Joy City (No. 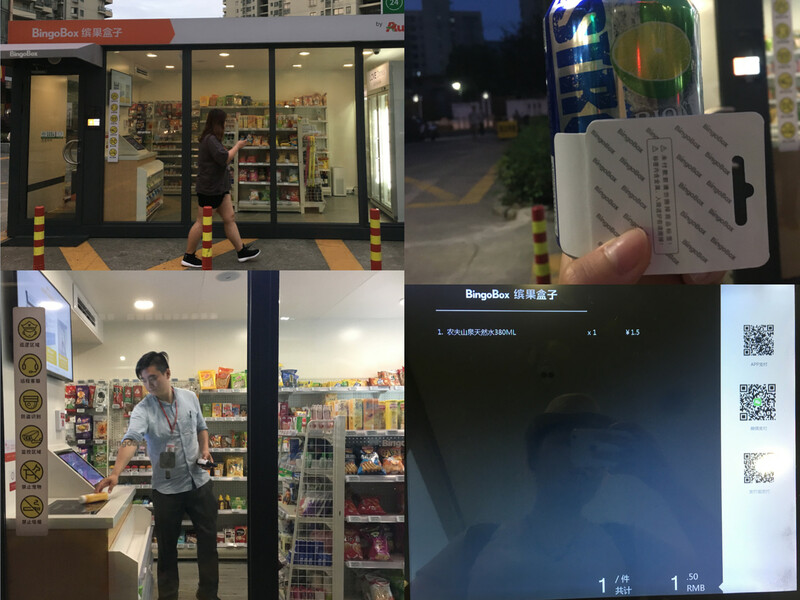 166 Xizang North Road, get off at Shanghai subway line 12, 8 Qufu Road) – One visitor witnessed that the smart mirror is no longer used, and the staff said it was turned off after Singles’ day. 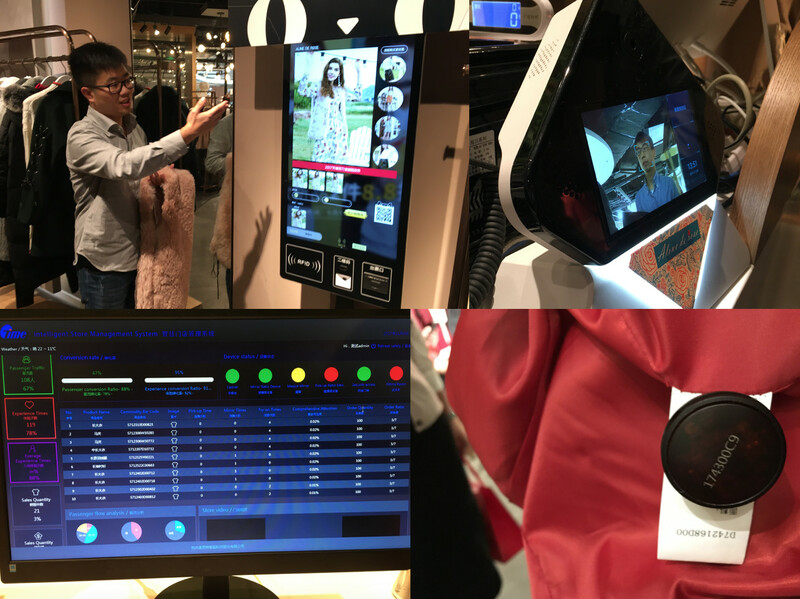 Hangzhou fashion brand Aline de Rose has used a number of connected devices in its smart store. All the connected devices were equipped by Hangzhou-based listed company Ontime, who makes smart mirror and RFID solution for retailers. The startup is an operating partner for Alibaba, and brand’s collaborating partner. 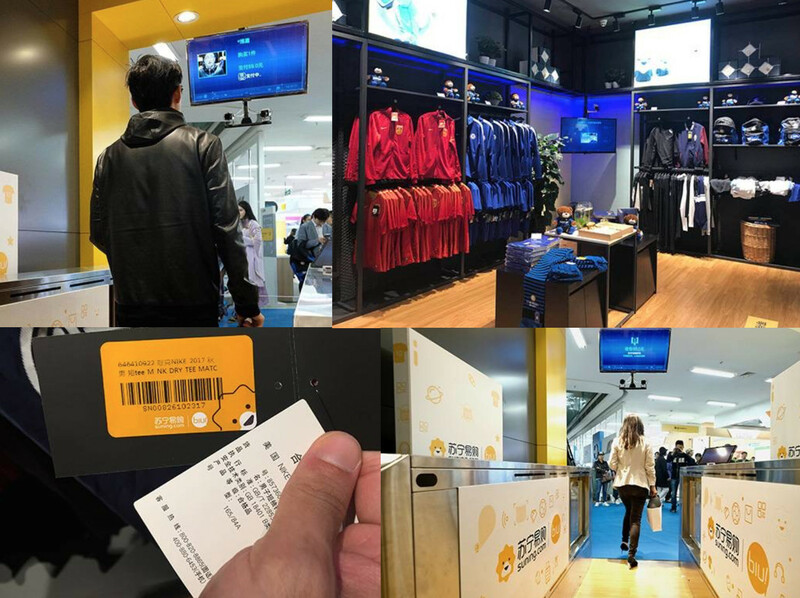 Once customers scan the RFID of any item in the store to the smart mirror, all related product information, such as stock availability, model showcase, mix-and-match products as well as its reviews from the brand’s Tmall Flagship store will be instantly displayed. Customers can place orders by scanning the product’s QR code or purchase onsite by using Alipay or facial recognition. Facial recognition technology is used in the store to collect information about number of customers at any given time, which allows merchants to adjust their staff and supply based on customer traffic and demographics. Ontime purchased UFace, a facial recognition technology provider that analyzes the age range and gender of the users. Under the agreement of the retailer, the startup gives the data to Alibaba. China’s answer to the Amazon Go unmanned store, BingoBox (缤果盒子) is an unmanned convenience store that can greet customers 24/7, and requires the customer to have a mobile phone to enter and purchase an item. When we tried one ourselves, we found the service had some flaws, such as invalid product tags and no paper receipts, causing customer frustration. At BingoBox, customers choose their wares, then scan the products with a scanner like a cashier would. A screen displays the running total and the shopper can complete the payment using Alipay and WeChat Pay. BingoBox says its stores offer prices about 5% lower than those of other convenience store brands, and that they provide RMB 60 in discounts for new users. At the beginning of 2017, they reportedly made progress in artificial intelligence to achieve accurate identification of more than 200 categories of goods.